Born in Rotterdam, the Netherlands and growing up in the formal atmosphere of a protestant, postwar country, proved, thanks to her drop-out/turn-on rebellion, a profound source of inspiration for the recurring subject matter in Hanselaar’s work; namely the balancing out of secret fantasies and fiery desires against a socially acceptable form. 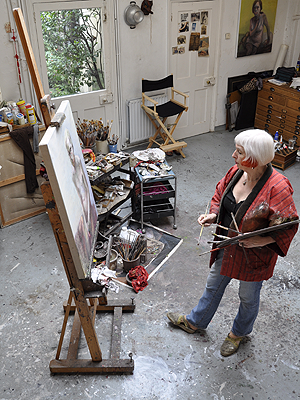 Although she studied briefly at the Royal Academy of Arts in The Hague, her lust for adventure, guided by a quest for self-discovery, led her to years of travel, until, in the early 80’s she settled down in her studio in London where she still lives. Self-taught, she started out as an abstract painter before turning to figuration. At the same time she became fascinated by etching, its harsh, bitten line seemed to perfectly suit her subject matter, namely the fierce and sometimes troubled cohabitation with those raw and uncultivated instincts within and our functioning in a civil society. As an artist Hanselaar looks for ways to express those illusive questions of who and what we are when the mask is off, and how we appear when the mask is on. Both her paintings and her prints display her delight and fascination with theatrical illusions and although often peppered with a biting sense of humor, the works reveals her own vibrant understanding of human nature, in all its animosity and fragility.